Block out unwanted noise with wireless noise cancellation on the WH-CH700N headphones. To optimise the noise cancellation, press and hold the noise cancelling button and activate Artificial Intelligence Noise Cancellation (AINC) and adapt noise cancellation to your environment. Background noise is analysed and adjusted for optimal performance on aeroplanes and other noisy environments. Keep your music playing all day. A built-in Li-ion battery delivers up to 35 hours of power and is rechargeable via USB. Quick charging gives 60 minutes of play back from 10 minutes of charge. Tune your headphones to your perfect sound with the free Sony headphone connect app for android and iOS. Easily adjust audio levels and digital sound field modes with a range of pre-sets and customisable EQ settings. AVAILABLE IN MULTIPLE COLOURS FOLLOW LINK FOR GREY & BLUE HEADPHONES. Also price matched and reduced at Curry's but a fiver more, if you want to pick a set up Sunday! Lol I posted this in the comments of the John Lewis one which has 270ish heat right now. Very poor noise cancelling on this model. For sub £200 range ANC headphone I would recommended BOSE QC25. The ANC is at QC35 level and it even lighter, more comfortable. It not really wireless but you can put away the wire and enjoy the ANC only (run with AA battery), AA Battery is a bit inconvenient however you do not have to worry about dead battery on wireless headphone. Wireless ANC headphones at this price range arent' good enough. I thought I was the only person that thought this. 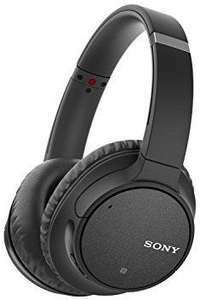 All the reviews I saw mentioned how good this was for an entry level ANC headphone but it was shite. Sitting on busses, trains, in cafe’s. I could hear all the ambient noise. The sound is 6.5/10 on these from me. Just got these today, i don't know whether to give them back just yet need to try them more. I did setup using app too.